Opel's board discusses a survival plan today. MUNICH -- General Motors sources today confirmed press reports that its Opel subsidiary could sell a German car plant to Daimler. A GM source said a decision could be made within weeks on whether Daimler, which makes Mercedes-Benz cars, will buy Opel's plant in Eisenach, eastern Germany, where the Corsa small car is made. Selling Eisenach to Daimler could help Opel to reduce its financial troubles. Opel is seeking help from the German government to finance a 3.3 billion euro ($4.15 billion) liquidity gap through the end of 2011, according to company sources. Opel's management today presented the company's supervisory board with a restructuring plan. No details of the plan were immediately available but German media reports speculated that it involves separating Opel and sister brand Vauxhall into a standalone division. The Frankfurter Allgemeine Zeitung reported that GM is aiming to retain a 30 percent stake in an independent Opel/Vauxhall, while simultaneously putting the future company at a disadvantage by transferring patent ownership for the engineering centre in Ruesselsheim back to GM. This would mean it would have to pay a 5 percent licensing fee for each car sold, the paper wrote -- a costly measure considering European volume carmakers can rarely generate a 5 percent operating margin and one which could very well scare potential investors away. German Chancellor Angela Merkel, facing an election in September, wants to save as many of the roughly 25,000 German jobs at Opel as possible and the government has said it will consider granting financing guarantees once it has seen the revamp plan. The German government is demanding that Opel becomes a standalone division before it approves any aid. German politicians are worried that state aid might be transferred to Opel's struggling U.S. parent. Earlier this week, Daimler said it has no interest in acquiring Opel, which could immediately give Daimler a sizable share of the small car market. "A takeover of Opel is not on the agenda. That also goes for Volvo or Saab," Daimler management board member Thomas Weber told Reuters. Bernstein Research analyst Max Warburton wrote in a report published Tuesday that Daimler may look to acquire Opel in order to gain scale and expertise in the compact and subcompact segments where he estimates the A-class and Smart have cost Daimler a combined 7 billion euros ($8.97 billion) in losses. 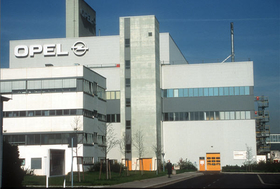 Opel's restructuring is expected to cost thousands of jobs and at least three plant closures, sources told Automotive News Europe. Senior GM Europe labor leader Klaus Franz wants to share job cuts across plants like Germany's Bochum, Antwerp in Belgium and Ellesmere Port in England, to save any single site from being closed. Today's board meeting came a day after thousands of workers demonstrated outside Opel's headquarters in Ruesselsheim for an independent Opel after 80 years as a unit of GM. Workers brandished signs like "Yes we can, even without GM" and "Free Opel."